SATAN'S HOST require no introduction, an American Metal Institution and one of the original Pioneers of both Thrash and Power Metal. Through the decades SATAN'S HOST have continually re-invented themselves, always remaining fresh and leading the pack of True US Heavy Metal! Formed in 1977, during the course of their 41+ year career (of evil! ), SATAN'S HOST have recorded and released 13 studio albums, 1 DVD and countless bootleg VHS’s, multiple bootleg live albums, have extensively toured the world, headlined every major metal festival on earth, permanently etching their pentagram-sealed mark at the very top of the Heavy Metal echelon! US Heavy Metal Titans and Power Metal legends SATAN’S HOST have unquestionably earned their deserved place in Heavy Metal History! SATAN'S HOST’s debut album, “Metal from Hell”, was originally released in 1986 on Web Records, and is a definitive and MANDATORY piece of classic 1980’s Metal history alongside Slayer’s “Show no Mercy”, Mercyful Fate’s “Melissa”, Venom’s “Black Metal” and Bathory’s “Bathory”! Combining Traditional Heavy Metal riffing with pre-“Power Metal” vocals, the high-energy of 1st wave Thrash Metal and all the evil of hell, SATAN'S HOST set a standard with “Metal from Hell” that has rarely been surpassed to this day! The album also created the original template for Power Metal, later capitalized on by legendary bands like Trouble, Fates Warning, Candlemass and Halloween. 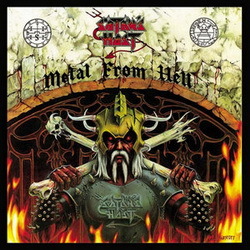 An interesting piece of Metal and SATAN'S HOST trivia, “Metal from Hell” has been the most bootlegged album in Metal history! Finally, 2018 see’s “Metal from Hell”’s first official release since its original 1986 publication. Additionally, the album has been completely remastered from the original source master reels, ensuring the best sounding version ever of this mandatory piece of Heavy Metal History! A Hellish opus filled with epic 'n' dynamic HEAVY METAL anthems – No one’s been able to touch the sheer mastery and uniqueness of SATAN'S HOST! One of the 5 MOST IMPORTANT albums in the History of Heavy Metal!